We are often asked how to best preserve the handmade items our customers have created. At The Woolery, we believe that each item you've lovingly crafted deserves the finest care - ordinary dish soap simply won't do! We recommend wool washes that are formulated especially to care for these delicate items. Not only will your finished projects last longer, but you'll be surprised at how easy and inexpensive it is to properly care for them! When selecting a wool wash, be sure to look for ingredients that condition and soften fibers naturally - a good example is the lanolin-enriched formula from Eucalan. Harsh additives and dyes (such as you would find in Woolite) damage fibers, so you'll want a formula that is free of phosphates, ammonia, and other chemicals, too. Finally, a no-rinse formula will not only save water, it will also save wear and tear on your handmade treasures! 1. 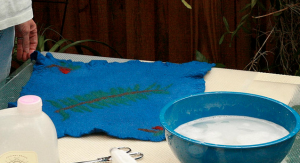 Fill a small basin with tepid water and add the recommended amount of your preferred wool wash. 2. Place the item into the water, gently squeezing with your hands a few times to make sure the soap and water is soaked through. 3. Allow garment to sit for about 30 minutes, then remove garment and remove excess water by squeezing gently. 4. Lay a dry towel on the floor and place the garment on top of it, then roll it up to remove excess moisture. 5. Lay item on flat surface to dry.